Not much has been known about Rage, id Software’s new post-apocalyptic game, other than it has a Mad Max look about it, EA will be the publisher, and we will not be playing it this year. That has been the extent of our knowledge until now, thanks to this month’s Game Informer article which gives us more insight into the game. 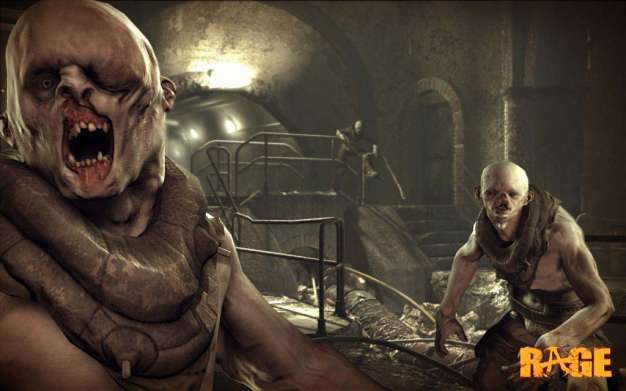 According to John Carmack, Rage is being designed to be played with a controller versus a keyboard and mouse because “the largest chunk of our market’s going to be on consoles.” He continues, “I mean, yes, you can use the mouse for it but it’s critical that the controller be the way that we design the game.” While the control scheme may be designed specifically for the controller, the PC version will offer higher resolutions, more anti-aliasing and faster texture page-in times, but the three versions will be essentially the same. Digging into some of the details of Rage, we find out that our health will regenerate as a benefit of our history, we can make money by appearing on a gladiator game show called Mutant Bash TV, and the multiplayer modes have not been finalized. Additionally, sounding oddly similar to Fallout 3, an engineering system will be available, allowing us to create sentry turrets and remote control car bombs, permitting that we have the blueprints and parts. The main thing we were concerned with knowing was the weapon system and we are not disappointed. Apparently Rage will offer weapon upgrades, like sniper scopes and stabilizers, and differing ammo types, one of which allows us to control an enemy for a short period of time before they explode. Add in the fact that vehicle combat is included with the ability to pick up ammo and power-ups while racing and the chance to upgrade car parts for better speed and performance. Rage is in development for PC, Xbox 360, PS3, and Mac and will be released “when it’s fun and when it’s done.” Meaning, not this year but maybe in 2010.